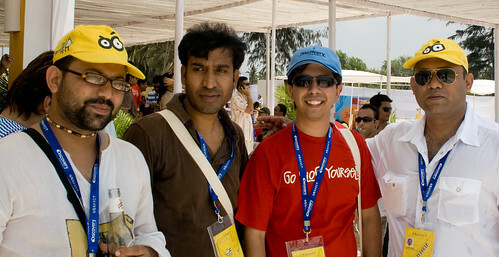 Over the weekend, I was at Cavelossim Beach in Goa to attend the Goafest 2009. This year the event focussed on the R-word â€“ â€œWhy this recession is too good to be wasted?â€ But I think the recession was more than evident at the event – lower number of friends from the industry, limited booze per person and no free water sports. 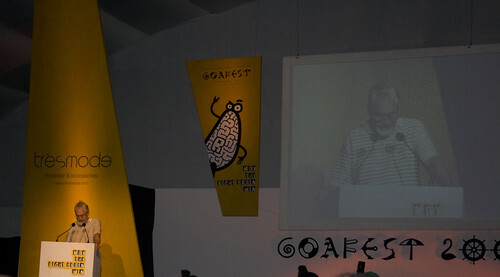 But then I think Goafest is more than just the number of beers you can drink. Itâ€™s about the opportunity for many young advertising professionals to hear some of the best minds and distinguished industry leaders share some of their vision and experiences. Sir John Hegarty explored how this recession is an opportunity to get more creative and evolve new channels of communication, products and embrace the internet more boldly. Neeraj Nayar spoke about the progression from just Branded Messages to Branded Utility â€“ Services. (will try and explore these talks in future posts). I guess a lot many have been disappointed at the very limited number of wins at the Creative Abby awards. Talks about the jury being very harsh and then admitting this on the stage left everyone amused. Of course, like always there was a lot of scam work (ads which are not actually released by the brand, but done only to win awards). Some of the work on radio (Virgin Mobile, Tata Magic) and integrated advertising (The Blind Childrenâ€™s Painting Exhibition & Domestic Violence â€“ Bell Bajao) was truly entertaining and award-worthy. DJ Akhtar at the Zoom party and Jalebe Cartel the next night really did some magic and got the dance floor filled up. Although the weather was sick, I think people just kept drinking from the bar to quench their thirst and dance away into the wee hours of the night. If there is something I am disappointed about this yearâ€™s visit, is the number of photos â€“ barely anything compared to last year. Sharing them online at flickr.